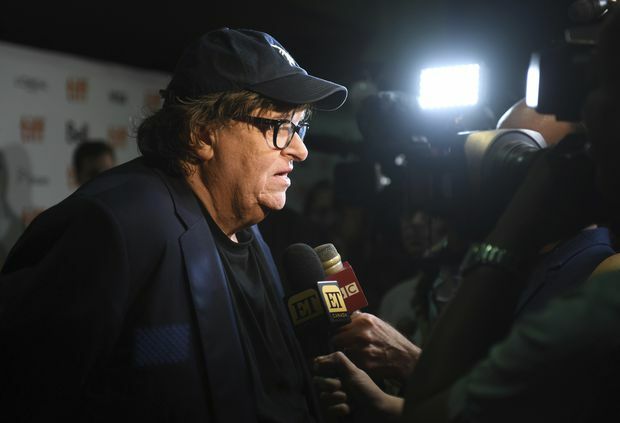 Michael Moore speaks with journalists as he attends the premiere for Fahrenheit 11/9 at the Ryerson Theatre on Sept. 6, 2018, in Toronto. It took about one minute for Michael Moore to begin flattering his Canadian fans on Thursday night, when he made his first appearance in three years at the Toronto International Film Festival with a scalding documentary about Donald Trump that makes a compelling case the U.S. President may have Hitleresque aspirations. “I’ve been thinking about what’s so special about Canada and why we are always drawn to come here,” Moore began. He spoke from the stage of the Ryerson Theatre shortly before the world premiere of Fahrenheit 11/9, whose title, by winkingly evoking his previous doc Fahrenheit 9/11, implies that the day Trump was declared victorious (Nov. 9, 2016) was a disaster on the scale of Sept. 11, 2001. It seems that, while Moore’s entourage was waiting in the departure lounge of La Guardia Airport, an Air Canada gate agent announced the flight would begin with preboarding of “travellers with small children and musical instruments first.” He emitted his trademark throaty chortle. “It just said so much about you: ‘Yes, we will have our children, but we will not cut the arts!’ ” Warm applause and self-satisfaction rippled through the auditorium: a tribe reaffirming its values. Still, it has seemed recently that the breakneck velocity and ironic tone of the culture has left Moore dated, if not entirely redundant. Do you want pointed, indignant faux-news comedy that seeks to hold leaders to account? John Oliver has you covered. Deliciously nasty commentary is more your style? May we suggest Michelle Wolf. Craving some bananas satire, with stunts aimed to humiliate hypocrites? Sacha Baron Cohen’s your man. As if sensing the old tricks no longer have the same power, Moore leans hard on the outrage in Fahrenheit 11/9, even as he overstuffs it with a litany of complaints: some new, many familiar. It’s like Michael Moore’s Greatest Hits, and even includes clips of previous films. He takes us back to the appalling spectacle of Trump’s speech in June, 2015 in which the reality TV star declared he would run for president. Moore reports that it was merely a stunt to extract more money from NBC for Trump’s starring role on The Apprentice: He was apparently upset that the singer Gwen Stefani, in her role as a judge on The Voice, was making more than he. Moore offers no proof of this juicy allegation; but then, we passed through the looking glass a long time ago, so it makes as much sense as anything else we’ve heard. He spends long stretches on the Flint water crisis, suggesting the city’s children got lead poisoning because of a Republican governor’s criminal negligence. And he argues that the American people are actually far more liberal than their political leaders, but flaws in the system (the electoral college, corporate donations, etc.) subvert the democratic process. He visits with left-leaning activists who are starting to believe they can change things from the ground up, including teachers in West Virginia who staged a successful strike for a living wage, and the heroic teens of Marjory Stoneham Douglas High School in Parkland, Fla., who responded to a mass shooting last February by sparking a nationwide movement. Those kids are inspiring, and he concludes the film with a mournful speech by one of them, Emma Gonzalez, at last spring’s March For Our Lives. But if the film breaks through the daily news cycle in the run-up to its wide release on Sept. 21, six weeks before the midterm elections, it will likely be because of a chilling history lesson it delivers of pre-Second World War Germany. Moore notes that the canny and charismatic Adolph Hitler was a master of the new media; that, after the Reichstag fire, he was able to seize control of the German parliament even though his party didn’t win a majority; that people made endless accommodations and excuses for his odd and authoritarian tendencies. A pair of esteemed professors and a 99-year-old former prosecutor at Nuremberg weigh in to suggest we’ve already failed to notice all kinds of important parallels. And then, the film syncs some black-and-white footage of a Nazi rally to audio of Trump, and it looks as if Hitler is pledging to make America great again. Michael Moore is back in vintage prankster mode. It fell to a few audience members to explain to him that Canadians could neither vote in U.S. elections nor financially contribute to campaigns. Doing more, after all, would be attempting to influence a foreign election. And Robert Mueller is already busy enough.